So yesterday I was considering posting some of our crafts for the Chinese New Year or Valentine's Day, but when I came home from my Christian Education meeting at church, I didn't feel like formatting pictures and doing it, so I put it off until today. Then I was checking out some of my favorite blogs (which I have not been doing as regularly as I would like) and noticed that The Magic Onions is holding a giveaway of Margaret Bloom's new book, Making Peg Dolls. Now I remember awhile back when Margaret mentioned to me in email that she had just gotten the deal for the book, but she was still keeping it low key. I am so excited for her and am so inspired for her. So my next stop of course was to check out we bloom here (Margaret's blog). Well on Monday, she kicked off her blog book tour and the post on The Craft Crow included a book review and a tutorial on love-bugs. 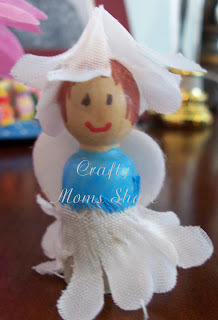 I felt inspired, so I went and found some peg dolls and some clothespins as well as my paint markers and some flowers I had been saving for making flower fairies, felt and a few of our leftovers from different Valentine's Day crafts. 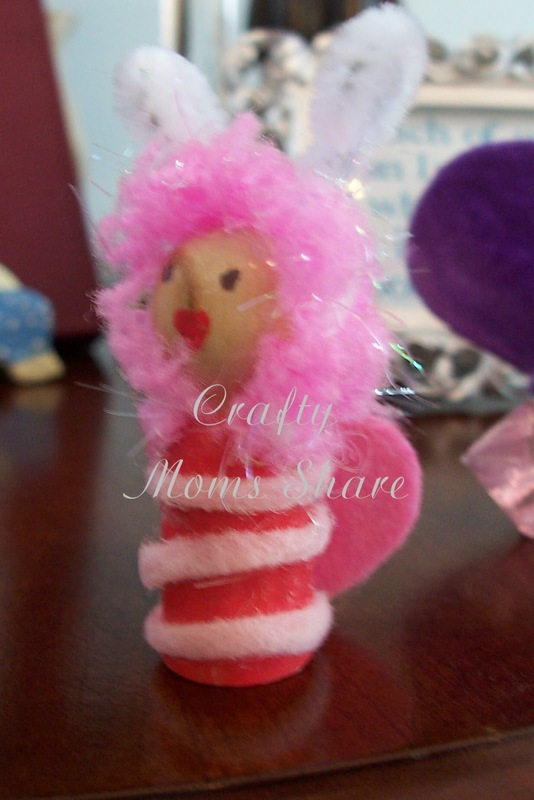 I made two peg dolls--one a love-bug inspired by The Craft Crow's and a little flower fairy that I'm calling a snow drop fairy. For the love-bug I painted the body red and cut pink felt stripes. I used a pink felt heart for wings. Then I cut a sparkly pink pom pom in half and it sort of fell apart, but I used it to cover the head. I painted a face on making the mouth heart shaped and then used a pipe cleaner as antennae. For my little snow drop fairy, I painted the body light blue. Then used a fabric white flower (probably a daisy) as a skirt. I thought the light blue did not show up well so I went over the part showing with a more turquoise color. I used a white felt heart for the wings and painted on a face and hair. Then glued the same type of white flower together to form a hat. 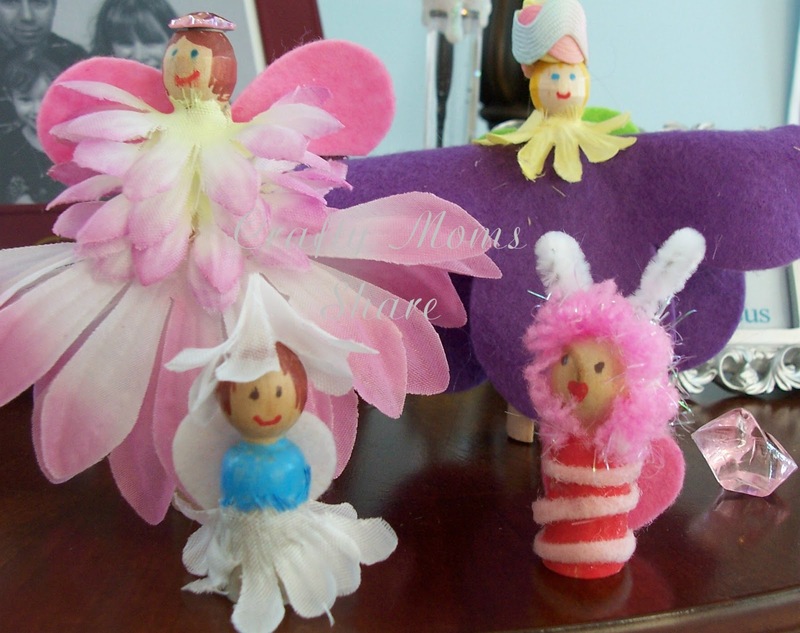 From the clothespins I made a chrysanthemum fairy and a queen of the flower fairies. 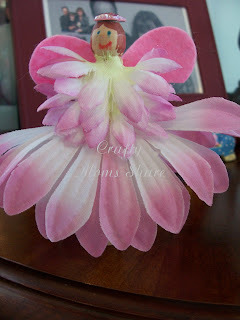 For the chrysanthemum fairy, I had flowers that were almost the same in two sizes. I used two large flowers on the bottom for the skirt and then used about five small ones for the top of her dress. I cut a pink felt heart in half and glued them together point to point for wings. I gave her a face and hair with paint markers and then put a sparkly plastic flower sticker for a hat. 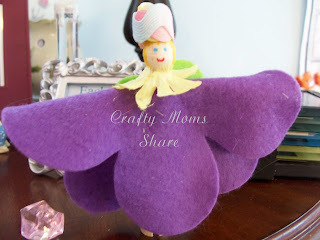 For my queen of the flower fairies, I used a large felt flower for her dress and a small fabric flower for the collar. I gave her a green heart for wings and painted on her face and yellow hair. Then for her crown I used zig zag decoration and wrapped it around to be a rosebud. It takes quite a bit of glue and holding to get it to stay but you can also just pass a few stitches through it. My sewing stuff was not near me and I was being lazy. Then I just glued it on. It was so fun to be inspired to craft again. Hazel is very excited to have some surprises this morning as well. How have you been inspired by something lately? Lovely creations! I'm very tempted by this gorgeous book! You made some beautiful lil' dolls!! I bet your precious doll greatly enjoys them!